In the late 1990′s, guitarist and producer Eddie Roberts was running a club night in Leeds called “The Cooker.” When The Cooker moved into a new venue with a second floor in 1999, there was space and the opportunity to put a live band together to complement the DJ sets. Simon Allen and Eddie had played together in 1997 as The Mastersounds, though with a different bassist and no organ. 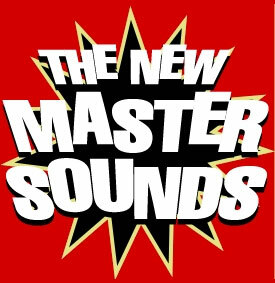 Through friends and the intimate nature of the Leeds music scene, Pete Shand and Bob Birch were added on bass and Hammond respectively, and The New Mastersounds were born. Though it was raw, and more of a boogaloo sound at first, it was powerful from the start. Their first rehearsal was hot enough for Blow it Hard Records to release on two limited-edition 7″ singles in 2000. Fast-forward 13 years and the recorded catalogue boasts 24 more 7″ singles, 8 studio albums, 2 live albums, 1 remix album and 3 compilation albums, released variously in UK, USA and Japan, where they continue to tour extensively. Joe Tatton, another veteran of the Leeds scene, joined back in 2007, replacing Bob Birch on organ and piano.